Today many players use the hybrid stringing method, where durable strings (such as polyester or Kevlar) are mixed with feel-oriented strings (gut). This originally began as a way to increase durability of strings, but today is used by players to combine the characteristics of different strings for more controlled spin, power and feel. The right combination of strings can positively influence the racket and bring forward the advantages of each string. Just for a quick orientational reminder – polyester strings (hard) are preferred strings for aggressive baseliners who use a lot of spin and are looking for durability. Stiff strings allow you to swing through the ball and put a lot of spin on it. Natural gut strings allow you to control the ball better and give you more feeling. There are also other types of strings (synthetic gut, multifilament polyester etc. ), but for the clarity of this article let’s use the durable polyester and natural gut as the two opposites. It is also good to know that the primary strings in your racket are the mains, which are strings you get the most playing characteristics from (this is why they always move when you play J). In a classical hybrid stringing method, polyester strings are used as mains, where focus lies on more spin. Natural gut as crosses provide for an extra feeling that would not be achieved in case polyester strings were used also for crosses. Be aware that when you use different types of strings for the classical hybrid stringing method, cross strings should be of the same gauge or thicker. If you use the same kind of strings while aiming for higher durability use thicker strings as mains. Reverse hybrid stringing method is the preferred stringing method of Roger Federer. Here, more durable strings (spin oriented polyester) are used as crosses and more playable strings (feel oriented gut) as mains. As a result, focus is laid on better feeling from the gut strings used as mains, while spin is increased through the polyester strings used as crosses. This method can get expensive as the mains are prone to break more often. Use the same gauge on both mains and crosses. Just like there is not the best tennis racket (because they are all different and everybody likes something else), there is also no best method for stringing. Try different strings (based on your budget, your ability and style) and try to find out which suits you the best. If you have any other questions or remarks to this article feel free to contact us. Enjoy your new strings and see you on Fuerteventura. Rec player of age. Before stopping playing tennis I want to try a hybrid. I want more topspin to my shots. I use Wilson Sensation 1.30 and now look for a combination with Luxilon Alu Rough. Which one for the mains? Breaking strings is no problem whatsoever. Tension of Sensation always been 25 kg. So for the Poly 24 or even 23 kg? What do you think? Wilson racket five, 103. Someone told me 2 kilos difference will change the shape of the racket! If you want more spin, definitely use the Luxilon as mains. These are 1.25 gauge which is pretty ideal in the combination with Sensation 1.3. Regarding the tension if you are used to play with 25kg in mains - stay with 25kg and use 24 for crosses. You can also try 2kg difference - see how you like it, but in my opinion it is not needed (you put more tension in the mains, because the longer the string the harder it gets to tighten it up - see electrical cables on street :)) so 2kg difference is probably not needed. Also 2kg difference will definitely not result it any permanent change of your racket shape. 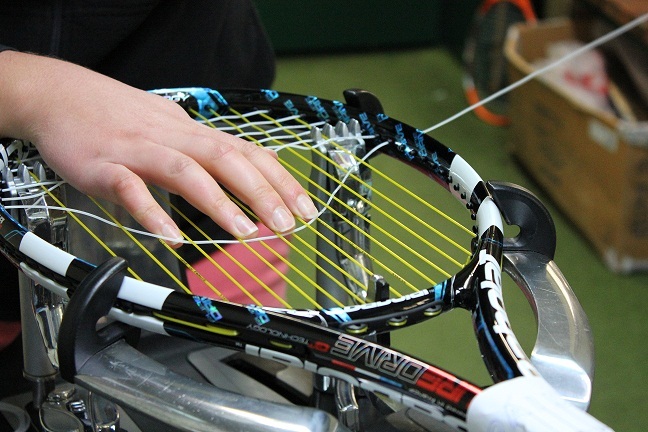 If you have a good stringing machine then the racket shape will not change even after stringing (sometimes when the racket is not well adjusted on 6 points while stringing, the head shape can change). I had a racket in my garage with broken string for almost 2 years and nothing happened to the shape of the racket. I am an ex-pro trying to find a string combination that will fit me. I have tried various strings to fight the shoulder and elbow pain, which was the main problem I decided to put down the racket from the tour then did not even play for 14 years. Now back in playing for 8 years, I still struggle to find rackets and strings. I did not have the notorious shoulder problem with Wilson Burn (1st generation) with Luxilon 4G soft strings. Since my contract ended with Wilson and was offered to play with Bridgestone rackets (famous in Japan and Asia although I live in US) by my old friend from the tour, my pain in shoulder came back and can't serve. I prefer poly as the benefit of spin is too much not to disregard. I love the frame so my main homework is to find a string or string combo that will not give me the shoulder pain. First, I will try to see if Wilson somehow will provide me with 4G's. But I would like to see if there's any recommendations out there. I prefer thin gauge strings and breaking strings is not a concern. I have tried gut for main and poly for cross and it just did not feel right. I tend to string tight as I always have been since tour days. Currently, I string my poly at 56 - 58 lbs and tried to lower it to 54 but I could not control balls at lower tension. I almost hit fences... The technologies for rackets and strings changed so much during those 14 years of my absence and it is ridiculous for me to catch up. I am looking for advise from you guys..
Well, from my experience, other players and me were getting mostly elbow problems from playing with polyester strings (especially kirschbaum :)). If you think your pain comes just from strings, try soft strings - natural gut. But if you try different strings and the pain still prevails I would rather look for a different racket (I assume that as an ex-pro your technique is good enough not to cause you any health problems). This Tennis for Beginners video control enables you to take in all significant tennis strokes in a well ordered arrangement with extra recordings that assistance you conquer the most widely recognized difficulties every one of the tennis novices confront. I generally welcome the considerable and superb work and Keep it up. It has significant data. A debt of gratitude is in order for posting this. Your blog is so intriguing and extremely informative. Certainly an extraordinary bit of work Thanks for your work. I by and large welcome the impressive and brilliant work and Keep it up. This Tennis for Beginners video control engages you to take in all immense tennis strokes in an inside and out asked for course of action with extra recordings that assistance you vanquish the most for the most part saw inconveniences every last one of the tennis novices confront. I use a hybrid RPM blast in mains and solinco vanquish(multi) in crosses in Wilson Pro staff97. Tension of mains is 50lbs and tension of the crosses are 55. I get a great amount of spin and pop as it improved my game a lot. But RPM blast cuts through my vanquish within 10 hours of play. Can you recommend any change so that I can keep the same feel while increasing the durability?